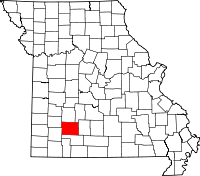 With a population of over 275,000, Greene County has the fourth largest population in all of Missouri. The county seat is the town of Springfield, which is where many of the considerable number of libraries and historical records locations are, many of them connected to the Greene County Historical Society. However, the Greene County Archives and Records Center at 1126 Boonville, also in Springfield, functions as the official repository for all of the county records. Green County was established in 1833, and many of the records on file at the Archives date back to that year, including circuit court records which stretch from then until 1991, deed books and land records dating from then until the 1960s, records from Probate Court, including wills, etc, stretching until 1990 from 1833. Many other random historical records are on file at the Archives, which can be called at (417) 868 - 4021.